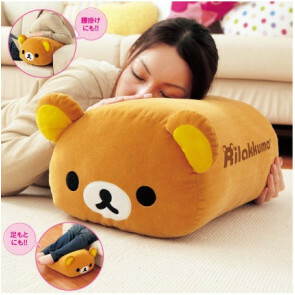 Rilakkuma リラックマ (also known as Relax Bear) means “bear in relaxed mood”. One day, this soft toy plush bear mysteriously appears and stays in Kaoru's apartment. Nobody knows why he has a zipper on his back, which when opened reveals a light blue polka dot patterned material. His favourite foods include dango, pancakes, omurice, and custard pudding. True to his name, he enjoys relaxing, eating, sleeping, lazing around, using Kaoru's yellow bean bag pillow, watching TV, listening to music and soaking in hot springs. 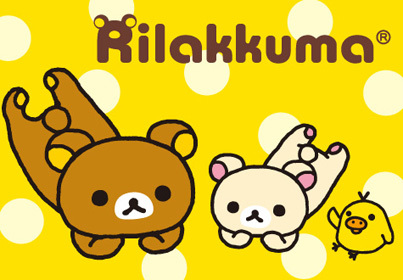 Korilakkuma コリラックマ (also known as Little Relax Bear) is Rilakkuma's little mischievous companion. She is a soft toy plush bear, but with a red button and no zipper. Her favourite foods include strawberries, apples and cherries. She loves listening to music and playing with her radio controlled duck. She frequently plays pranks on Rilakkuma while he is sleeping, such as drawing on him, putting headphones on him and sewing odd color patches on his bear suits. Kiiroitori キイロイトリ (also known as Yellow Bird) is Kaoru's pet chick. Some say that Kaoru's yellow bean bag pillow is in fact Kiiroitori. All we know is Kiiroitori is basically the opposite of Rilakkuma because of the bird's hard-working nature and love of cleaning. Which San-X character set do you want to see at UFO Star Station?